Stems: Erect or ascending, simple or branched from base. Plants strigose. Leaves: Alternate, cauline, sessile; blade spatulate to elliptic, oblong, or narrowly lanceolate, 2/5 to 2 inches long, 1/25 to 2/5 inch, tip rounded or acute. 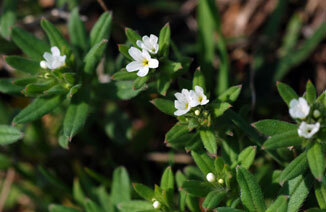 Flowers: Calyx .2 to .28 inch, lobes 5, linear to triangular; corolla white, salverform or funnelform, tube .2 to .33 inch, 5-lobed, lobes spreading, entire, not crinkly, apex rounded to obtuse; stamens 5, included. Fruits: Schizocarps; nutlets 4, light brown to gray, ovoid or angular, 1/10 to 1/7 inch, irregularly wrinkled and pitted. Comments: Lithospermum, stone and seed, and arvense of cultivated fields.